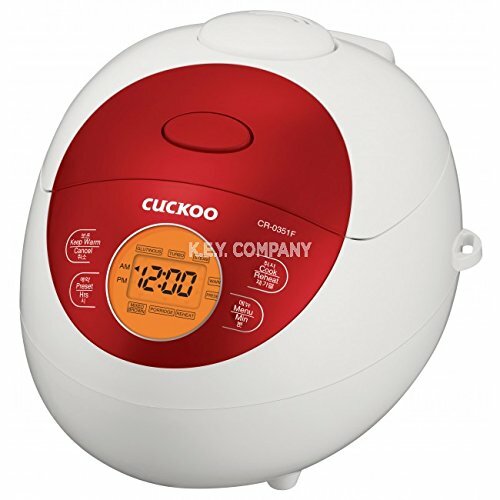 There are lots of rice cooker brands out there to choose from and today we’re specifically going to focus on Cuckoo. One of the things that I like the most about this company is that their products are very cool looking. 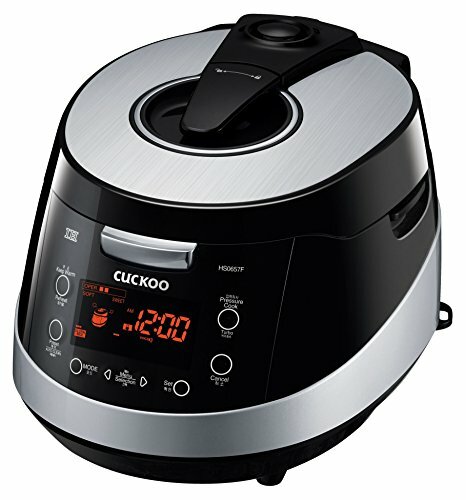 Most of the pressure rice cookers cooker models that they offer have a unique style to them, so you can pick your model based on look if that's important to you. They are very functional as well, and one of the most popular brand of this style of rice cook, so you can't go wrong with whichever set of features you go with. 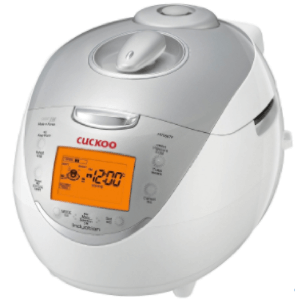 The company itself sells Korean-style rice cookers, which means that they tend to gelatinize the starches in rice to a greater extent than Japanese brands. Mmm. Tasty! I love all rice, and can appreciate each style for its uniqueness. I lived in Asia (China, specially) for many years, so know a good bowl of rice when I have one. In this post, I'm highlight the best options that Cuckoo has to offer. These cover a range of different styles and price points. I also want to note that all measurements for capacity are given in terms of cooked cups of rice and that this refers to the measuring cup that comes with any rice cooker. Now, rice cookers can be a little confusing in this regard because the cup they use is roughly two-thirds the size of a conventional measuring cup. So, take this into account when you look at what capacity you want in a rice cooker. Update: Some people have sent messages that even five is too much to choose from, and they wanted a more compact way to decide the best Cuckoo rice cooker for them. So I've narrowed it down to a top 3 as well, which you'll see in the chart below. Of these three, my #1 choice is the Metallic Blue LED Pressure Rice Cooker (10 cup). Below I listed it as 20 cup cooked, but it's 10 cup dry. Here's the 6-cup (dry) version. This rice cooker is one of the few that ends up looking fairly attractive visually, although you mightn’t realize that it is a rice cooker at first glance. As rice cookers go, this one is also on the small size and has a maximum capacity of 6 cups of cooked rice. The company estimates that this is enough to feed 3 people. As such, the rice cooker is likely to work well for some families but may be too small for other families. In addition, the model does also have a few features, including turbo cooking, which allows you to cook rice faster than you could otherwise. Another one of the features is the ability to reheat rice. Theoretically, this model should also be extremely easy to clean, as it uses a nonstick inner pot and also has a steam cleaning system. At first glance, this rice cooker may look like a larger version of the previous model, especially as the style is similar. However, this model is actually very different, as it relies on pressure cooking, rather than more conventional approaches to rice cooking. In general, the idea of pressure cooking relies on the practice of creating a pressurized environment within the product. Doing so allows food to be cooked much faster and can potentially improve the flavor profile and the nutrients. All of those aspects are key reasons why people often turn to pressure cooking approaches in rice cookers. An additional interesting thing about this model is that the manufacturers appear to have focused on quality components. In particular, they note that the inner pot has an x-wall diamond coating, while the outer pot is titanium. It’s not clear whether those material choices make any difference to the overall quality of the rice but they may be appealing to some people. Those aspects could also make the rice cooker last longer. That’s certainly a good thing if you’re going to invest in a pressure rice cooker. At first glance, the main differences between this and the earlier red model appear to be that this one is twice as big and the style is significantly different. 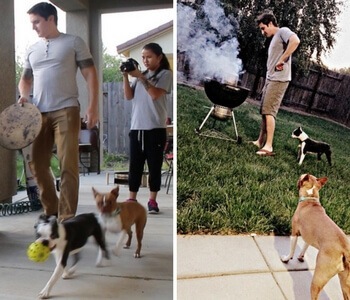 Nevertheless, there are some other less obvious differences that are much more relevant. One of these is the fact that this rice cooker also has a slow cooking function, so it could actually double as a slow cooker. That feature may be especially relevant in small kitchens and it can be more practical than having both devices. As with the earlier example, this model does also have a turbo function that helps to make cooking faster. There is also an additional GABA function. That option may not be relevant for everyone but it’s a useful feature if you do make GABA rice. 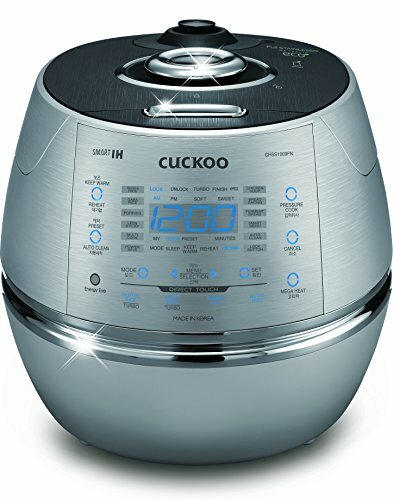 This rice cooker continues Cuckoo’s trend of having rice cookers that look unusual and the style here is different again. In this case, the model is another pressure cooker and has the same capacity as the model that we discussed earlier. The biggest difference with this model seems to be the functionality. For example, the rice cooker has 11 cooking settings, which includes a multi-cook feature. That feature means that the rice cooker can be used for a lot of different meal types and, potentially, for pressure cooking in general. The model does also have a voice guide but this is in Korean only, so it won’t be much help to many people. Now, we want to point out that while this model can double as a pressure cooker, it is not exclusively designed for that role. As such, it is unlikely to be as effective as a dedicated pressure cooker for other types of food. The only issue is that it's Korean Voice only, so if you only speak English, you may want to consider other models on this page. This final model is another example of a pressure rice cooker and it’s also on the expensive side. One key reason for the price is simply the capacity, as the rice cooker holds up to 20 cups of cooked rice. That capacity is fairly common in standard rice cookers but it is fairly unusual in ones that rely on pressure cooking. There is also a considerable amount of different cooking settings with this model along with a voice guide, which does have an English version. The other interesting thing about this rice cooker is that it uses Smart NFC, which stands for Near Field Communication. This allows people to remotely control the rice cooker with a smartphone, although in this case, it will only work for Android phones. That approach may seem like a bit of a gimmick but it could be useful for some situations. 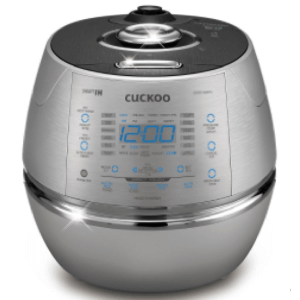 Essentially, this is a high-end rice cooker that has just about every function that you could imagine. Out of all these models, the Metallic Blue LED Pressure Rice Cooker is the clearly the best, however, it is likely to be out of the price range of most people. At the same time, there are relatively few people that would feel the need to invest in a high-end rice cooker like that one. 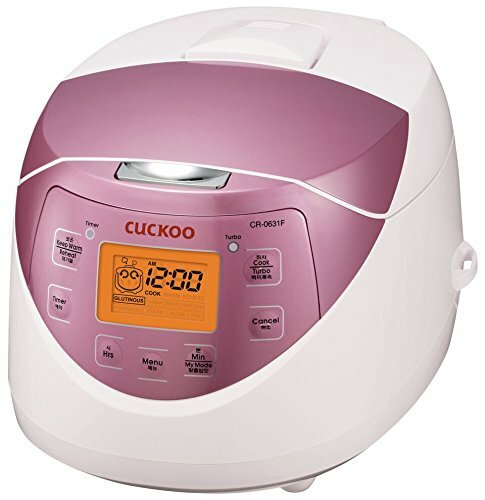 With that in mind, the main model that we recommend from Cuckoo is the Pink Electric Rice Cooker. This isn’t a pressure cooking model but that also means that it is also considerably less expensive. At the same time, the rice cooker does still offer a decent number of functions, including the ability to act as a slow cooker. The various functions make this a versatile rice cooker and one that would suit most homes without breaking the bank. The 12 cup capacity is also an appealing size. With that capacity, you still have the ability to make enough rice for a large group of people but you aren’t faced with something that is excessively large and takes up a lot of space. When I was in Korea I bought a Cuckoo CRP G1030MP. I was promised English instructions but it came with Korean only. Very disappointed. How do I obtain an English manual for this cooker. I have looked everywhere on line without success. Thank you. If it was bought in Korea, it might not have the English instructions programmed into it. Otherwise, I’d find that model on a site like Amazon, then contact a seller from there to see. Not all models have English instructions.